Pacific herring have made their way into two bays along the Oregon coast last week, which Oregon Department of Fish and Wildlife (ODFW) says could mean they will soon be entering estuaries. They showed up in large numbers at Yaquina Bay in Newport and at Coos Bay. ODFW said it is now spawning time and schools of this important forage fish usually appear and then disappear periodically. Jigging for herring is a great way to introduce kids to fishing. Use a multiple-hook herring jig from a dock or pier. Many anglers catch herring this time of year to use as halibut bait; salmon, on the other hand, prefer a higher-quality herring found in bays later in the year. This could also mean an exciting show for beachgoers in some places, such as at Seaside's Necanicum River mouth. 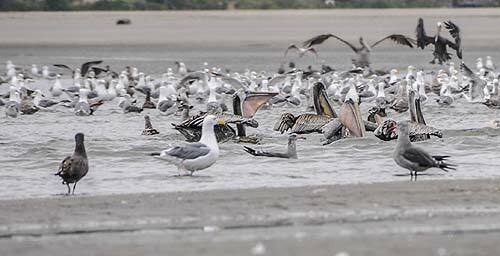 When lots of baitfish show up there, often a frenetic feeding frenzy ensues as pelicans and seagulls attack the water in massive flocks. The arrival of so many herring can also bring lots of whales chasing them, as happened last summer when large numbers of Humpback whales hovered close to north Oregon coast towns like Cannon Beach and up the Columbia River. There have already been some reports of a handful of whales in the Columbia in the last two weeks, which could be a sign of a rollicking whale watch season – and one that starts early. Whale migration has already begun, however, and Gray whales are not scarce along the beach towns. Depoe Bay's Whale Watch Center said the grays have been growing in numbers since the early part of the month. Earlier this week, they saw as many as 16 per day on some days. Gray whales primarily eat mycid shrimp, which is found in abundance in the Depoe Bay area year-round. Others, like Humpbacks, feed on baitfish like herring. More about Oregon Coast Whales here.